Someone is out to stop the "GSS Intrepid," an interstellar colony ship, from being completed on schedule and beginning its journey to 82 Eridani. When anti-colonial activist groups are suspected, Major Tanis Richards, an officer in the field of military intelligence and counterinsurgency, is brought onboard to hunt them down. A public disgrace Tanis suffered at the hands of the military has motivated her to leave Sol and start a new life elsewhere. She soon discerns that more than simple activist groups are arrayed against the ship and its crew. There are corporations and governments that have a vested interest in ensuring that the "Intrepid" never leaves the Sol system. Tanis tightens security and fights political red tape while running up against assassins and mercenaries sent to the stop her and the "Intrepid" at every turn. The new friends and relationships she forges strengthen her resolve to protect the ship and keep its crew and colonists safe as they endeavor to head outsystem. Have you ever had a book just sneak up on you? 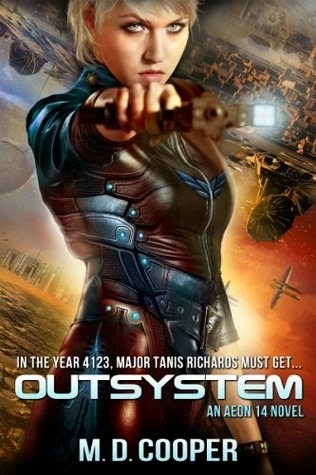 That was Outsystem for me. When I first started reading it, I was a bit like oh, this is okay... Then, I realized that I kept coming back to it and when I hit the end of the book, I groaned out loud that it was a cliffhanger. Just when I thought it was wrapping up nicely, too. I found the futuristic and body modification pieces to be fascinating. I honestly rarely think about where we're going. I'm so busy trying to make sure that day to day life is running as smoothly as possible. This book caused me to pause and realize just how far we've come and how far we could go. The characters were relatable and the book moved along at a pace that kept my attention from wandering but not so fast that I was left confused as to what was happening. All in all, if you're looking for a futuristic sci-fi type book, this is one that I can recommend.